We loved to sing together. When we were in the 5th and 6th grades our favorite was "Shine, Jesus, Shine." Later, our song was "All and All." Every time we sang it or heard it, no matter where each of us were, we'd just look at each other and smile. Also, whenever we sat together during church he would sing the bass part of the hymns (usually the echo) right into my ear...even if it meant he had to stand on his toes. Kory had such a good voice that blessed me every time I heard it. I remember my first day back to school after my cousin Tyler died. Most people weren't sure what to say, so they just avoided either me or the subject. 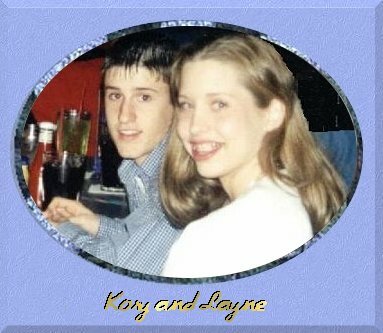 Kory knew that there was nothing he could say, so every time he saw me he'd just give me a hug with a sympathetic, yet caring look on his face letting me know that he loved me. Those hugs helped me so much to get through that day. Kory was such a blessing in my life. God blessed me greatly by putting him in my life. I am so thankful for the memories that I have of him. I'll treasure them always. I have a great memory of Kory and whenever I think of him I think about this. One time in 5th grade we were all on the bus coming home from a basketball game. I think in 5th grade we were about 11 years old. Well anyway, because you think this kind of thing is cool when you are 11, everyone just started going out with everyone else! Well, Kory and I thought it would be cool to hook up for the night so we did. Everyone was holding hands, so, of course, Kory and I held hands. I was sitting in the seat in front of him so we had to reach over. I remember Jacob walking down the aisle and Kory and I jerking our hands back into our own seats. Now that I think about it, that is hilarious! But back then, we were living on the edge! When we got back to school, we all got off the bus and I was standing with someone on the hill. Kory came over and I gave him a kiss on the cheek and he looked so cute! That is about all I remember of that night, but that is my favorite memory of Kory. Another good-funny memory that I have of Kory was in the fifth grade. The bell just rang and me and Kory were the only ones in the class (by the way...this was when he had a big crush on me) and we were talking. All of a sudden he kissed me on the cheek just as Mr. Grubb walked in! He was like well geez, Kory can't you wait till school is out. Our faces both turned red and we got out of there as fast as we could!! It was sooo funny! 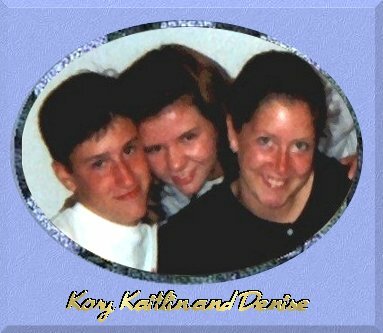 I met Kory through Denise at Bible Drill in Windemere my sixth grade year. Me and my friends saw this cute guy walking Denise and we wanted to know who he was! We were in line to rent a paddle boat and I told Denise to introduce us. Later that summer at Church Camp in Van Buren, Denise comes to me and asks me to see if I remembered him. Well of course I did! Who could forget someone like him! Well she told me he liked me and wanted to ask me out. At the pool we swam and he ended up asking me out. He was the sweetest guy. I remember that by the time I got home from church camp, I already had a letter from him waiting for me in my mailbox! It started out..."It hasn't been 10 mins yet and I already miss you!..." 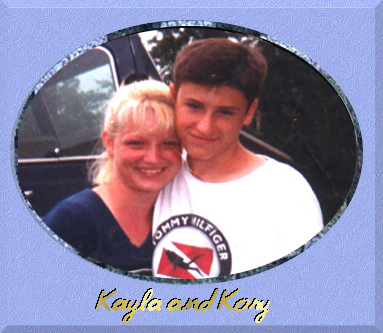 Kory was really my first real boyfriend! As a matter of fact, he was the first guy that I ever held hands with! He was the perfect boyfriend! My whole family loved him, especially my mom. They were "buds", she even had a nickname for him, "Korky"! He hated it, but he never said anything because he didn't want to hurt her feelings! Kory was special, as you all know. He always stood out from all the others. He holds a special place in my heart. When God took him away from us, a part of my heart went with him. But I know that one day, Kory, I will see you again and it will be the best bear hug ever!!!! I love you! I would always have Kory come to my sister's birthday parties, so that I wouldn't be the only boy there!! One year when he came, he didn't know what to give sis for her birthday, so he just took one of Ashley's stuffed animals and gave it to her! Another memory that I have of Kory is when we went to church camp together. I would never go to church camp, but Kory was determined that I would go. Finally, he talked me into it and we had a blast! If it wasn't for Kory I would have never went. Kory has made a great impact on my life and I will always remember all of the fun times that we spent together. When you asked me to give you a memory about Kory, I couldn't pick just one..so instead of telling you all of them, I'll just tell you a little about how we were best friends. 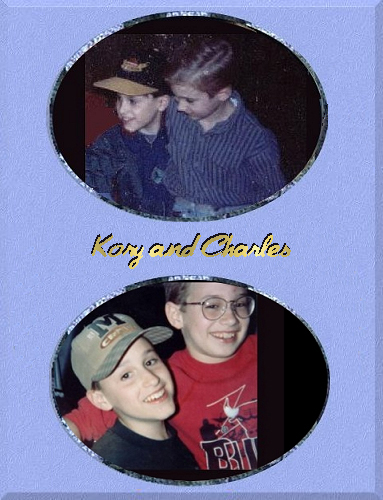 For as long as I can even remember, Kory was always there, he was there on my first day of daycare, the first time I ever spent the night with anyone, my first day of school, our first girlfriends ... Everything, he was there for everything. 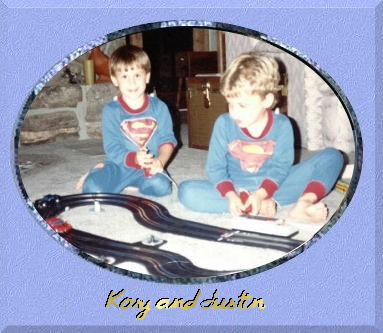 I always thought of Kory as a brother, a twin brother, not because we looked alike, because we didn't, but because he and I were so alike with what we liked, how we handled situations, and our taste in girls was exactly the same... I know that because we were always switching girlfriends with each other.